March 16 is almost here. March 16 is Mr. Quirky's birthday - and my second favorite day of the year. My first favorite day of the year is MY birthday. I have never minded birthdays - the whole getting older thing has never bothered me that much. As much as I love having a whole day that is all about ME, I must confess that the true source of all the anticipation and excitement is - the cake. As far back as I can remember I have loved white cake with white icing. 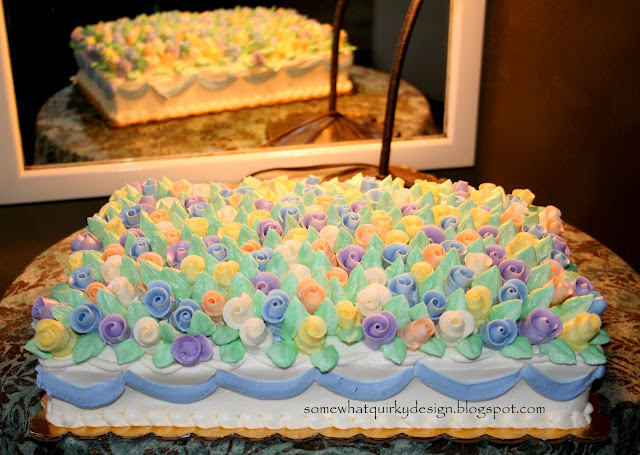 White cake with white icing is the whole reason you attend weddings, baby showers, retirement receptions, birthday parties...oh well, you know. If I attend one of these events and there is no white cake with white icing, I feel cheated - like the host has somehow failed me. Because when it comes to cake I morph into "its all about me, Karen." Oh yeah, I forgot we were talking about Mr. Quirky's birthday cake. You know that expression "he had me at hello?" Well - he had me at "I like a little white cake with my white icing." Add that to the fact that he is the geeky yin to my non-geeky yang and I was, well, a gonner. During the regular year we eat all other kinds of desserts. Cheesecake, white chocolate cake, chocolate cake, pound cake, hummingbird cake, and any other kind of cake.... or ice cream. or cookie. But for birthdays we go to Holiday Market in Royal Oak, MI and order a quarter sheet cake - white with white buttercream. They have THE BEST butter cream icing I have EVER had. In the "the cake I got for you is better than the cake you got for me" battle Mr. Quirky has always won. I have never been able to figure out what the difference between MY "this cake needs to have A LOTTTTTTTT of icing, I mean A LOTTTTTTT" and HIS "this cake needs to have A LOTTTTTT of icing, I mean A LOTTTTTTT." The stories of how many times I have had to beg forgiveness for the lack of icing and how many times I have struggled to keep my composure while I explained to the bakery person that "No, this is not A LOT of icing. I know this because the cake does make me go "ugh" when I pick it up from the weight of the icing" are as long and tedious as this sentence. 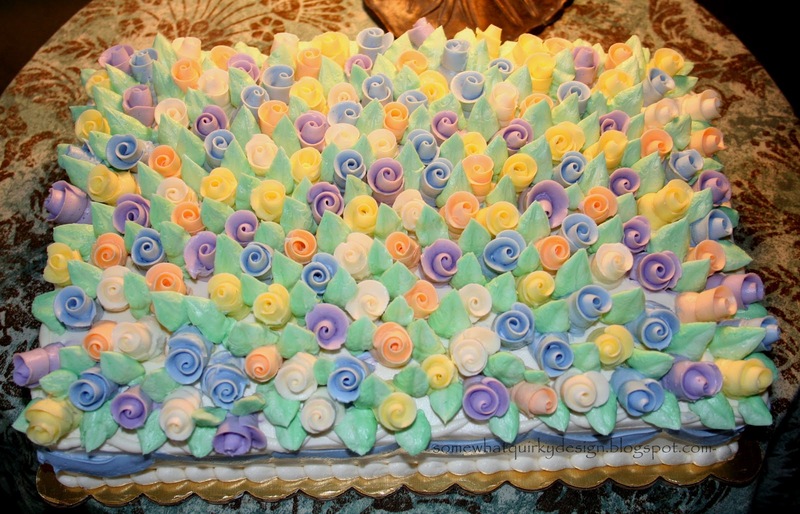 So - I will just move on to the point: The cakes he orders always look better and have more icing than the ones I order. All that was before The Picture. After I convinced her that "No, I did not want just a tub of icing to add to the cake I had," they made us a new cake. This one was more like what we had in mind. Before we cut it we did a photo shoot. The Picture was born. Now, when it is birthday time we just take The Picture in and say "it needs to look just like this." So, here I sit, gazing lovingly at The Picture, counting the days until I cut into the best birthday cake in the world, put it on my plate, stick a fork in it, and put it in my mouth. Pitiful. Pathetic. I know. I probably shouldn't mention that we will eat the entire cake by ourselves in a matter of days. It would last longer if it weren't for me. Mr. Quirky is actually capable of eating only one fairly large piece a day. I am not. If he doesn't eat to keep up, I eat the whole thing. Deplorable. Distressing. I know. Oh well. All that said, it is a mere 7 days until the cake walks through our door and I cannot wait. Thank you God for inventing white cake with white icing. PS There probably won't be any linky parties for this cake - I'm not much for sharing this cake. I thought I was the only one who really ate the icing others seem to cut it off have fun! 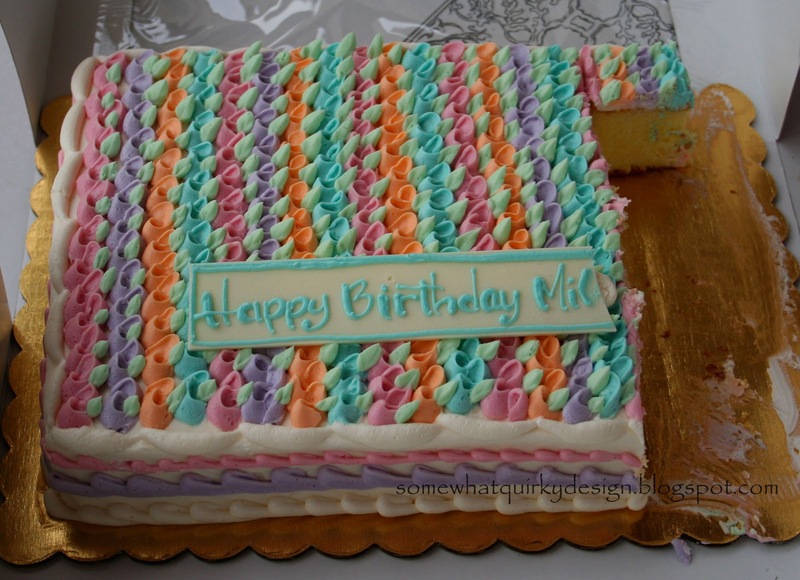 I think I just might order a cake myself for Mike's birthday and eat it all in honor of him and in honor of cakes and in honor of icing. And thank you for the award you gave me and for the very nice things you said. It almost made me cry. That was sweet. OMG!! I JUST LOVE STOPPING HERE!! I KNOW THAT AT SOME POINT IN THE POST I WILL LAUGH RIGHT OUT LOUD!! THIS IS MY VERY FAVORITE TO DATE!! GREAT POST!! YOU ARE HUMAN PROZAC! That's one gorgeous cake. Don't know if I could eat it, but it's way pretty. If you ever get to Los Gatos, CA, be sure to go to Icing on the Cake, the best bakery I've ever known...ever...seriously! Happy Bday to Mr. I Love a Little Cake with My Frosting Please! One of the greatest decorative icings I've seen on a cake! oh yummy!!!! there is nothing better than a good buttercream on a white cake!!! lucky you, I'm drooling just looking at your pictures! 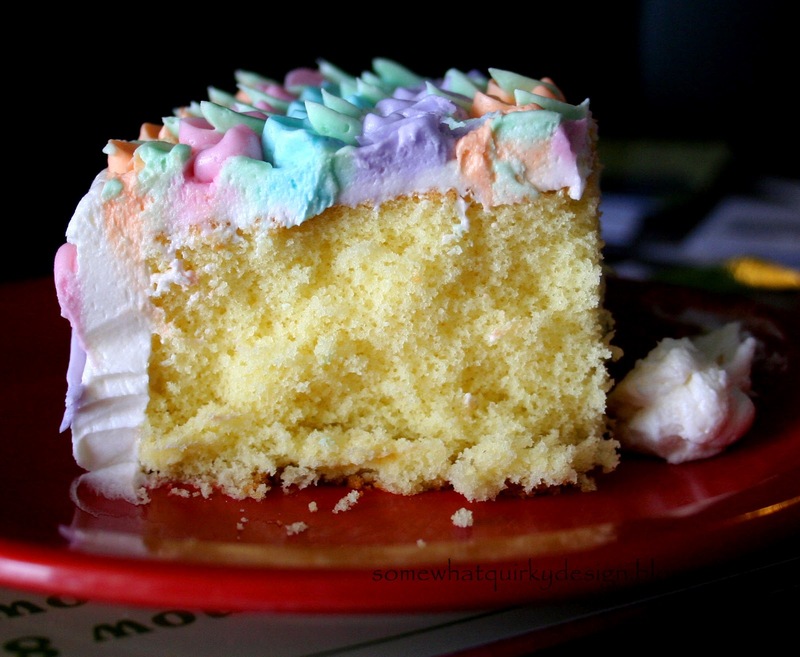 and yes, white cake and white frosting are just the best. and it does seem almost blasphemous to have a wedding, shower, christening, without one. My son used to work at a fabulously expensive resort as their audio guy. Whenever they would have a wedding, he would pilfer me a piece of cake and bring it home. I got to taste so many amazing wedding cakes...but my always favorite is white cake with white icing...like this one. What a gorgeous, gorgeous cake. I am practically drooling here. I'd totally come to your birthday celebrations! This looks quite delicious. Thanks for linking up to Alphabe-Thursday's letter "Q".